Rhinebeck Equine LLP offers veterinarians highly experienced in lameness diagnosis and performance evaluation. This highly specialized area of practice requires a good grasp of anatomy, a keen eye for gait analysis, and sensitivity in detecting subtle abnormalities. Thorough history taking, observations of work under saddle or on a lunge line, and a combination of diagnostic nerve and joint blocks are often required to determine the cause of unsoundness. Experience in the use of and interpretation of diagnostic modalities such as radiography, ultrasound, nuclear scintigraphy, and MRI is essential. After diagnosis, our veterinarians recommend treatment that may include therapeutic joint or tendon sheath injections, regenerative therapies, focused shock wave therapy, arthroscopic or other orthopedic surgery, acupuncture or chiropractic sessions, or a multitude of other options. Prepurchase exams are an important service that our veterinarians provide, and can be invaluable in making a decision about the purchase of a new horse. A comprehensive physical exam, soundness evaluation, conformation analysis, and health history compose the typical exam. 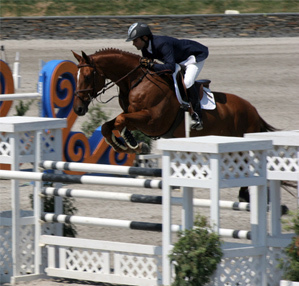 Specific concerns of the prospective owner are addressed, with close attention paid to the intended use of the horse. Radiographs, blood work, drug screens, endoscopy, and breeding soundness exams are additional components often recommended by our veterinarians or requested by prospective owners. Focused extracorporeal shock wave therapy is a treatment used to enhance the body’s own healing. The shockwave unit is portable, allowing this modality to be offered both on the farm as well as at our hospital. Treatments are performed in the standing, sedated horse and generally last 20 minutes or less. Shockwave therapy is a method of treatment for equine musculoskeletal injuries that was originally developed as a means of treating kidney stones in humans (lithotripsy). It is now used in the field of human medicine to treat plantar fasciitis (heel spurs), epicondylitis (tennis elbow), tendonitis of the shoulder region and some non-union fractures. The shockwaves are acoustic energy that is “focused” on specific areas deep within the tissue. This therapy has been used for many conditions including tendon and ligament injuries, “splints”, “bucked shins”, “ringbone”, “chronic heel pain”, “bone spavin” and sore backs. Most conditions require three treatments a few weeks apart.